PARTIT KOMUNISTA MALTI: HMS Illustrious visit to Malta exposes Government’s Hypocrisy. 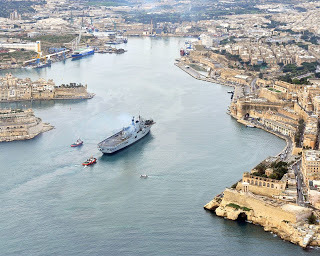 HMS Illustrious visit to Malta exposes Government’s Hypocrisy. The HMS Illustrious visit to Malta exposes the imperialist agenda in the Middle East. This strategy involves the financial, military and diplomatic support to Israel by Western countries. “Between 2008 and 2012 the British government licensed arms exports to Israel amounting to £130 million. By selling arms to Israel, the British government is giving direct material support for Israel's aggression against the people of Palestine and is sending a clear message of approval for its actions”. The Communist Party of Malta deplores the hypocrisy of the Maltese Government to allow British Naval Forces to make use of our port, when Palestinian people are being killed in Gaza. Government should hold a clear position with regards to Palestine. We call other organisations to appeal to the government to stop supporting imperialist countries and to show more respect to the Palestinian people. The attack on Gaza is an aggression on all Palestinians. Budget for the well off. Communist Party condemns Israeli attacks on Gaza.